Mix ingredients. Shape into 1½” balls. Bake on ungreased cookie sheet at 400° F. until light brown, about 20 minutes. In a casserole, mix cream of chicken soup, milk, and nutmeg. Add meatballs. Bake at 350° F. for 30 minutes of until done. Stir in sour cream and bake for 10 minutes longer. Fix up your favorite meal and enjoy the beauty of quilts at the same time with the new Amish Quilting Cookbook. Its 130 pages are packed with 316 favorite recipes from 58 of Lone Star Quilt Shop’s quilters. Twenty of their finest quilts are featured in color throughout the book. The book is wrapped in a concealed spiral binding to help avoid spiral tangles while it keeps all the conveniences of traditional spiral. Fourteen sections from Amish wedding foods to snacks. 136 pages. 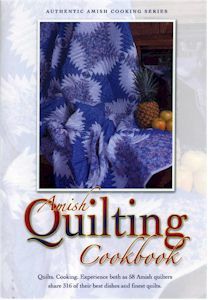 Amish Quilting Cookbook . To order this book, please see our friends at http://www.Amishshop.com. Richard from Amish Stories.